So one of my New Years resolutions was to clean out my email inbox and keep it clean. January 1, I had over 3,000 unread email messages. Yes, you read that right - over three THOUSAND. After hours and hours of deleting, I managed to get down to ZERO unread messages. And I am proud to say that 2 weeks into the new year, my inbox is STILL down to zero unread messages. Not only have I been reading and deleting, I have also been going back and cleaning out old messages, categorizing recipes, and deleting ones I don't want any more. I have found a few gems in my cleaning - long-forgotten pictures that have been sitting around collecting virtual dust, and an unused gift certificate for Sur la Table! So...armed with my found money, I got myself a few new toys! What is that strange orange triangle, you ask? That, my friends, is a tagine. A tagine is a cooking pot with a tall, conical lid that seals in moisture and makes deliciously tender stews and dishes. It is used in Moroccan and North African cooking. I have always wanted one, and now I do! I'm SO excited! The set (which was on clearance...woohoo! Bonus!) 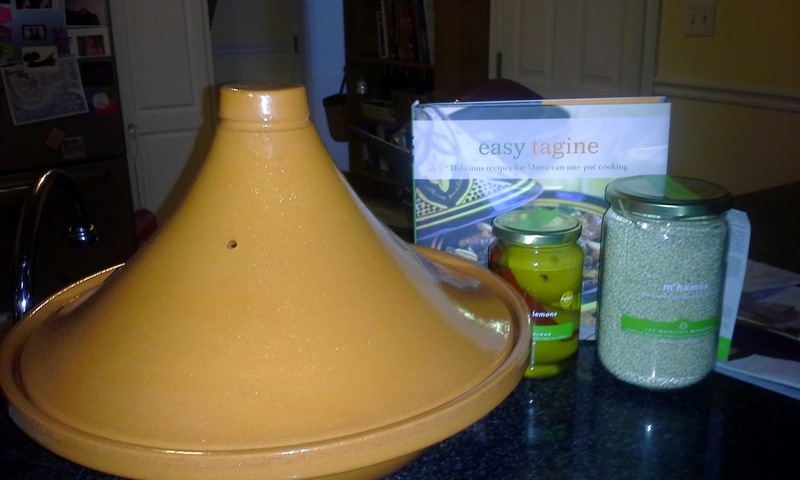 came with the tagine, a cookbook, a jar of couscous, and a jar of preserved lemons. I also had enough to get a little jar of black truffle salt. There has been a lot of cold-weather cooking going on in my house lately. Nothing warms you up like waffles for dinner, or homemade chicken pot pie. Crockpot cooking screams cold weather to me, so I decided to see if I could find a good recipe for pork loin in the crock pot. 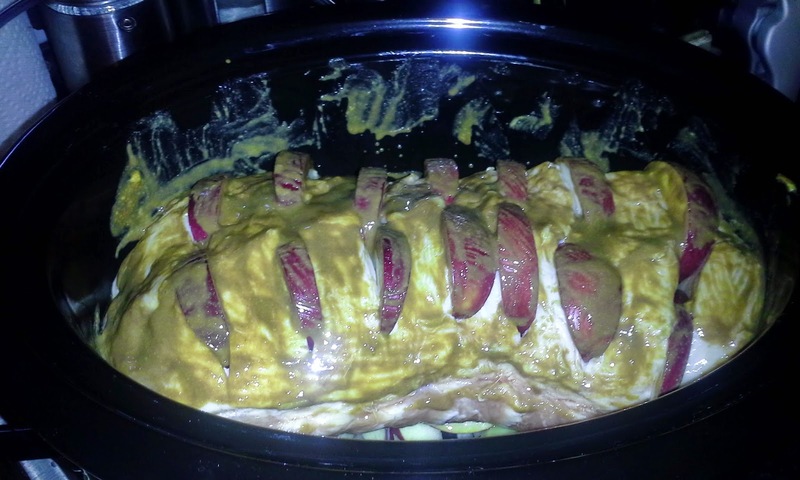 In my search, I found two recipes that looked interesting to me - this Slow Cooker Brown Sugar Pork Loin, and this Crockpot Honey Pork and Apples. They both looked delicious, so I decided to make my own hybrid of the two! 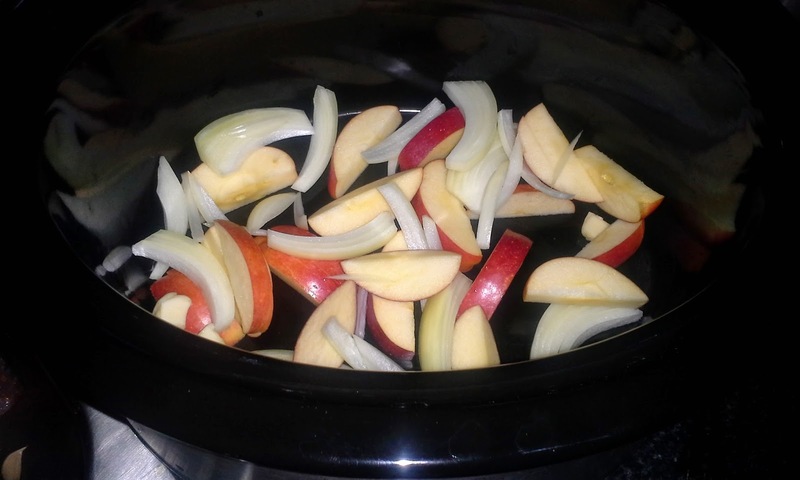 Crockpot Brown Sugar Pork and Apples! First, I sliced the two smaller apples (I'm not sure what kind they are - maybe Gala?) and the onion, and scattered them in the Crockpot. Then, I rubbed a cut clove of garlic all over the pork loin before cutting slits into the pork and forgetting to take a picture of it. 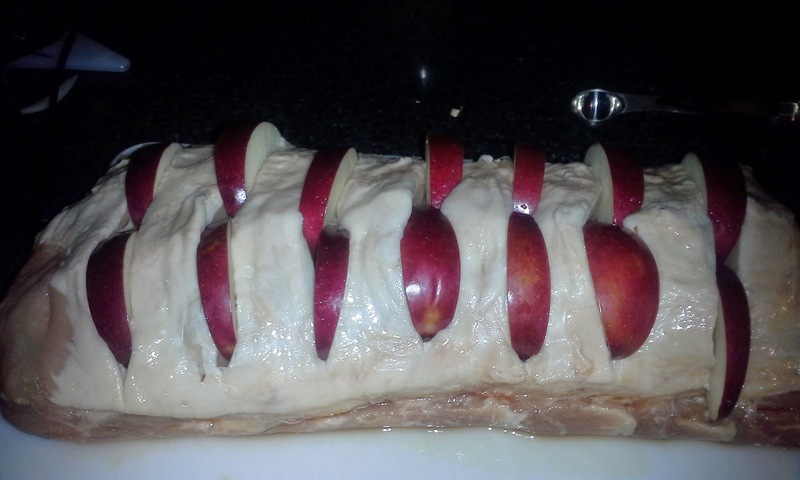 Then, I sliced the remaining apple and put a couple slices into each slit in the pork. 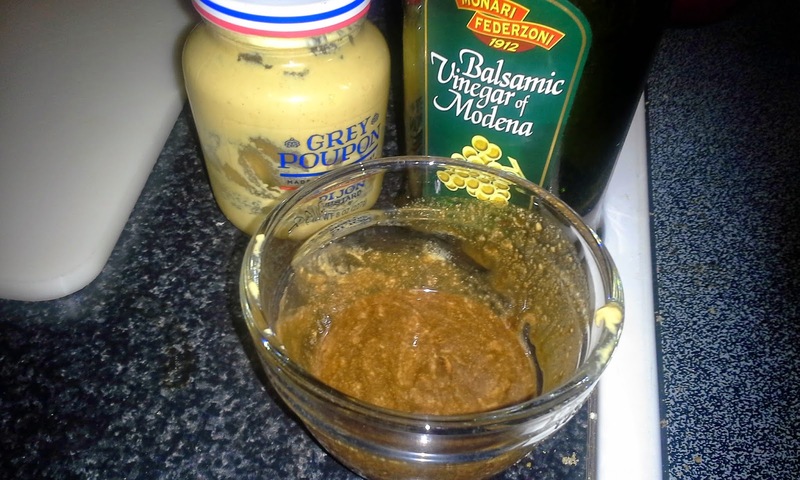 Next, I stirred together the balsamic vinegar and dijon mustard. What a pretty concoction! 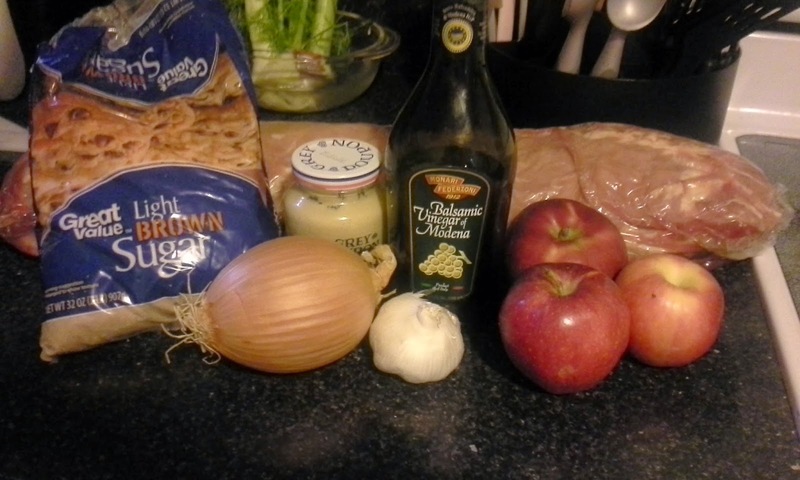 I placed the pork loin on top of the apples and onions in the Crockpot and brushed it with the vinegar/mustard mixture. 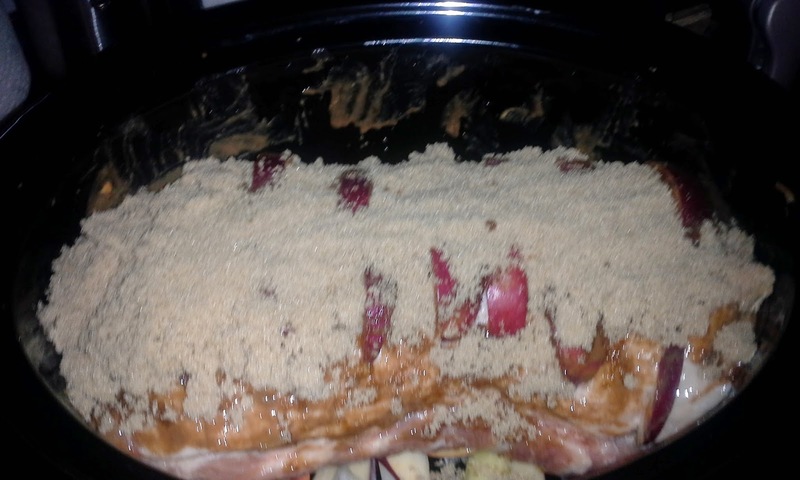 Last, I rubbed it all over with the brown sugar, then turned the Crockpot on low. And now...we wait. For 6 to 8 hours. I hate to wait! And then, 6 to 8 hours later...we don't take a picture of the final product because we are at work and forget to ask the family to take one. But the verdict? A bit dry, so maybe a shorter cooking time is in order. But still delicious! Definitely a do-over, with that minor change! Wow...how time flies. I can't believe it's been a year since I last posted! I guess things got a little busy with school, work, and life...but a year??! Jeesh, what a slacker! I finally finished school, which was SO exciting! I don't officially graduate until May, but I am DONE! I also started working in May, which has been fantastic. The summer was rough - my first kitchen job, and I was thrown right into a busy Summer season in a beach resort town - talk about chaos!! I decided to give up selling Pampered Chef...my last semester at school and new job didn't leave me any time to devote to it! I still love and use the products, but I am not selling them any longer. We moved into a big, new house with family members. There are 7 of us living here - talk about a full house! So far, so good though!! I am ready to start posting again though! I am going to try really hard to post regularly. 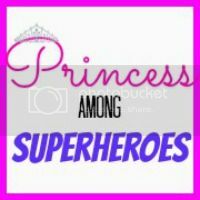 My initial goal is 1 new blog post a week - that doesn't seem like too much! I even have a new recipe that I'm (hopefully) going to post today! If it doesn't go up today, it will tomorrow at the latest! 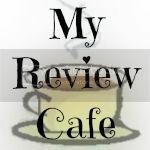 My goal here will be to share recipes that I find and love. I have a HUGE backlog of recipes I want to try, and this blog gives me the perfect opportunity to try a new one every week and post it! Another cold, snowy day...I am loving the time off from school, but it's kinda messing with my motivation! First, chop up your vegetables. I used my Pampered Chef Food Chopper to cut them all up pretty fine, and it only took a few minutes to do them all! I added a carrot to sweeten things up a little bit - and it never hurts to sneak in a few extra veggies! Brown your meat in a little bit of olive oil. 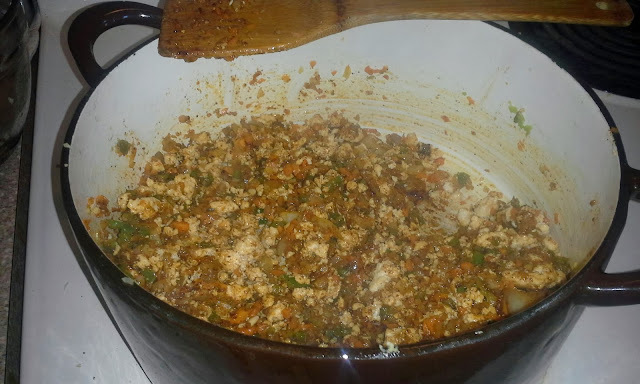 I used ground chicken because it was all we had in our freezer (we eat a LOT of chicken...lol). It doesn't get really brown, but once the chili was done, you couldn't even tell! 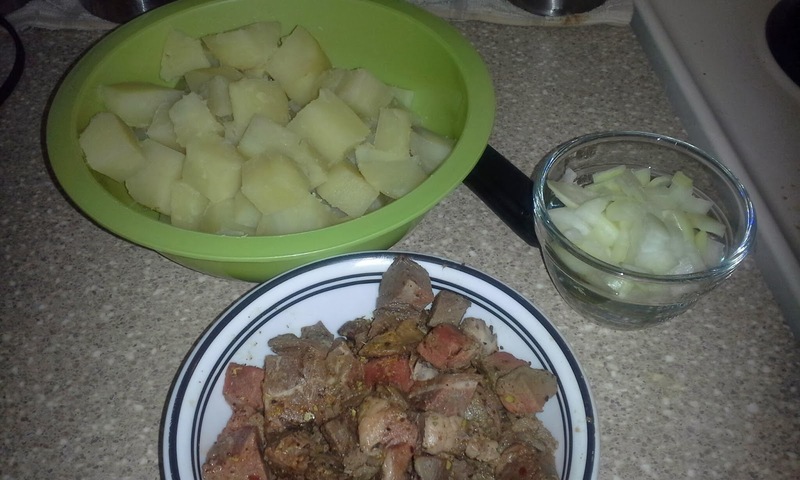 Remove the meat from the pot and drain it. 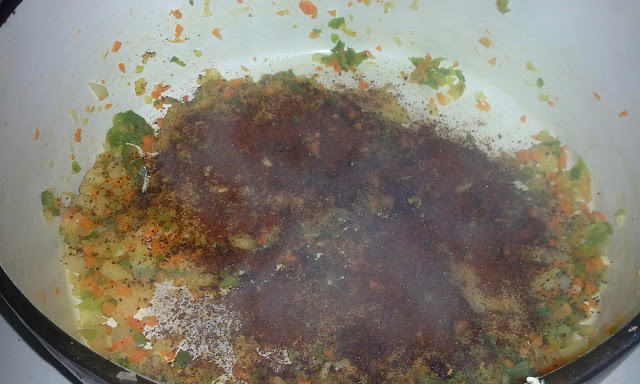 Throw in the vegetables and cook until they are nice and soft. Add your meat back in, and a good handful of chili powder. I like a lot - I usually end up using around 1/4 cup. Use as much or as little as you want, depending on how strongly spicy you want it! ...then add in your tomatoes, some water, and your beans. 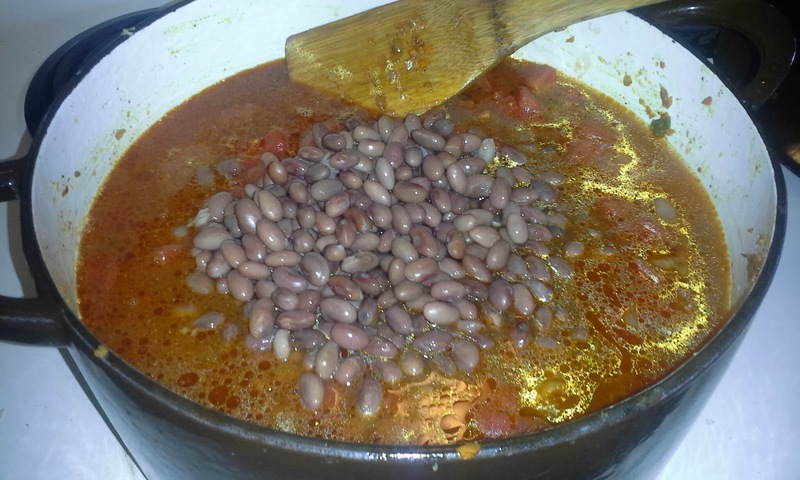 I used dried beans which I had soaked overnight; if you use canned beans, don't add them until the end. Dried beans will need a while to cook. 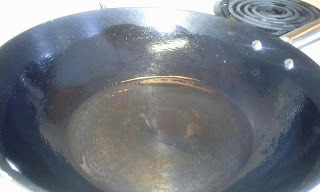 Bring it to a boil, then reduce the heat to a simmer. 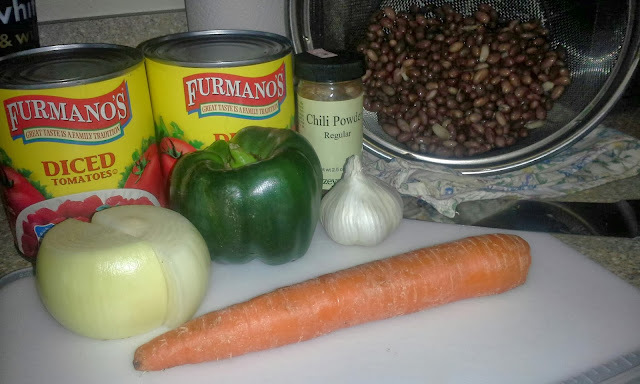 Cover and cook for a couple of hours, or until the beans are tender. 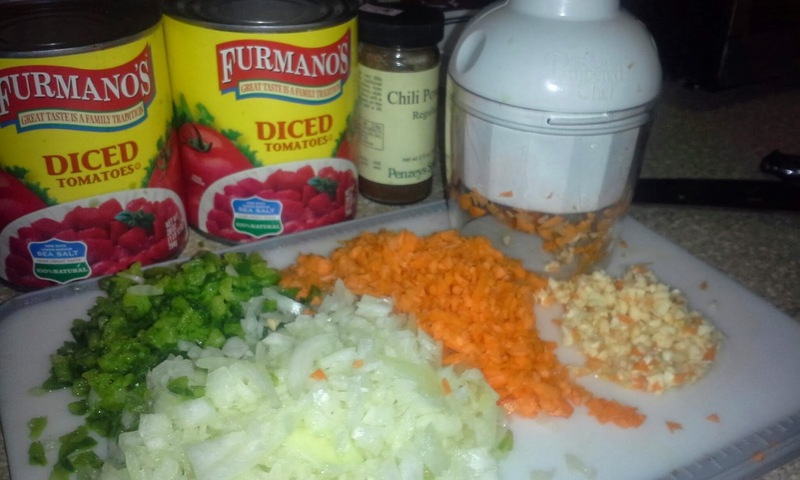 Once the beans are tender, turn off the heat and let your chili sit until it is cool enough to go in the fridge. 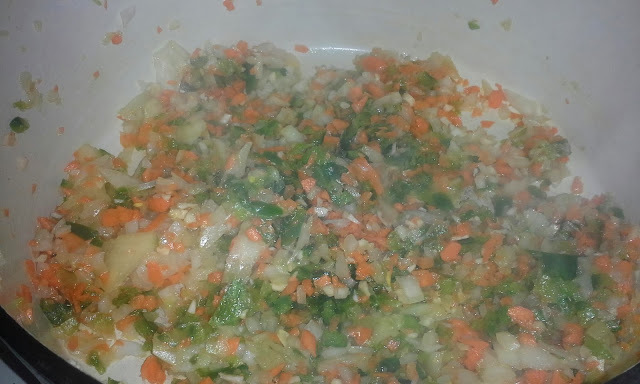 Then just put the whole pot in the refrigerator and let it sit for at least a day or two. Trust me on this step - it tastes SO much better when it has a few days to rest! When you are ready to serve it, warm it up on lowish heat until it is nice and toasty warm. Get your sour cream and shredded cheddar ready, and - of course - make a batch of delicious homemade corn bread. 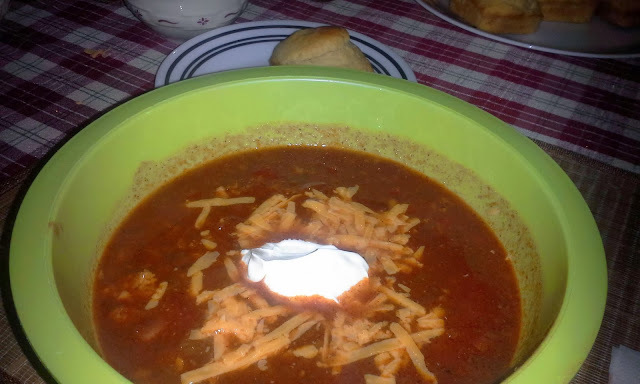 Serve your chili in a big ugly green bowl, topped with shredded cheddar and a dollop of sour cream. Delicious, soul-warming heaven on a cold, snowy day!! I hate leftovers. My family hates leftovers. Leftovers are icky! I have become very good at cooking just enough to feed my family with no leftovers - nothing to save, nothing to throw away. But sometimes, the dreaded leftovers just can't be avoided. And one of my favorite exemptions to the 'icky leftover' rule is spaghetti sauce. 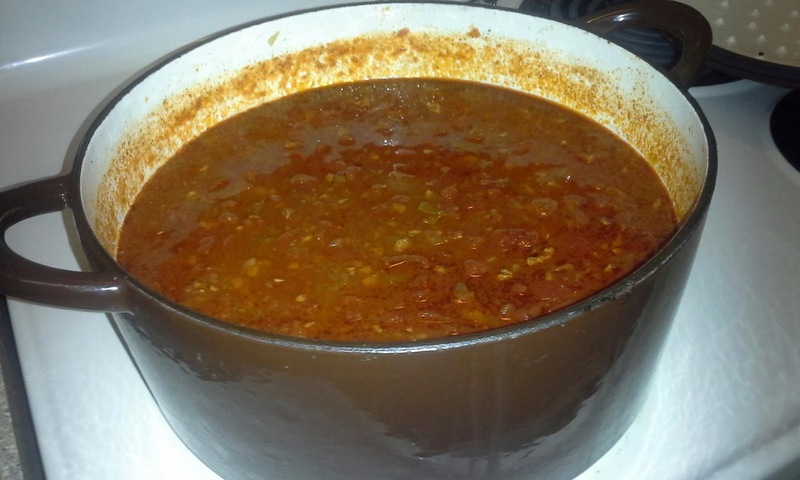 There is something so wonderful about a huge pot of sauce, simmering away on the stove. It's a great weekend, clean out the fridge kind of meal. 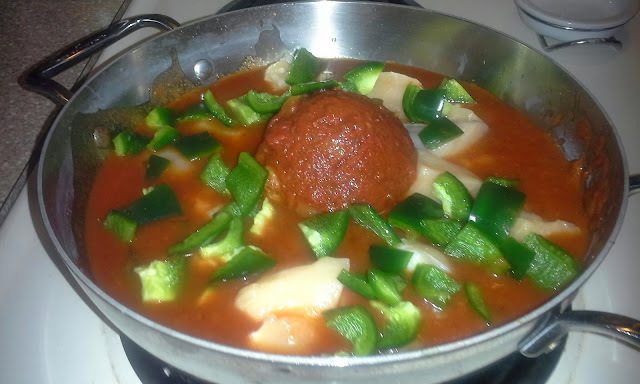 Make a big pot of sauce, open your fridge, and go on a hunt for meat. Whatever you have leftover in the fridge, throw it in there. Couple pieces of chicken here, a pork chop there...throw it in the pot and give it new life. You never know what you might find in there! When I make sauce, I always have a ton of leftovers. One pot is good for 5 or 6 family meals. Throw it in the freezer and it just keeps getting better! 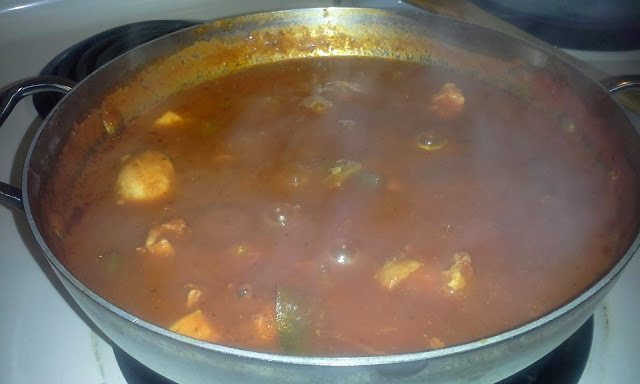 One of my favorite ways to serve leftover sauce is by turning it into a quick, easy chicken cacciatore. 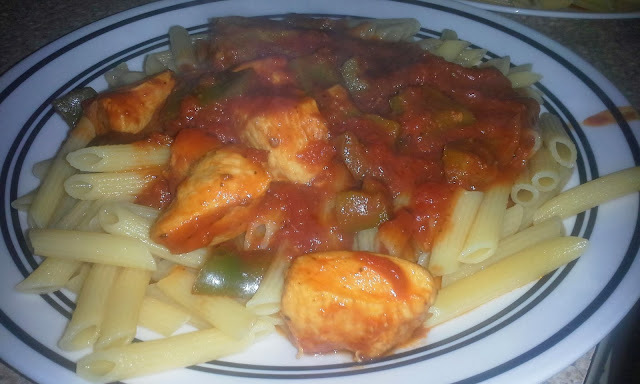 By using the leftover sauce, you get that wonderful slow-cooked flavor, boosted by fresh peppers and quick-cooking chicken breast. If you have a little extra time, legs and thighs are fantastic for this too! I used boneless chicken breasts for this batch. 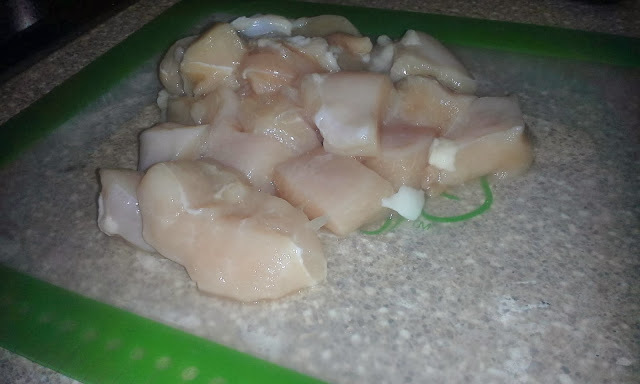 Three breasts, cut into bite-size pieces. Chop up your peppers into bite-size pieces too. 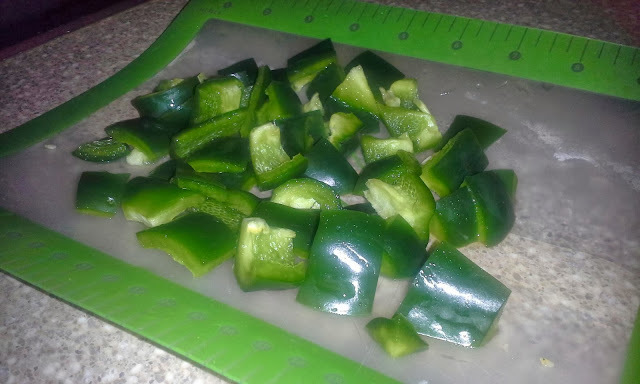 I used one green pepper for this batch, but I actually prefer it with sweeter peppers, like red or yellow. 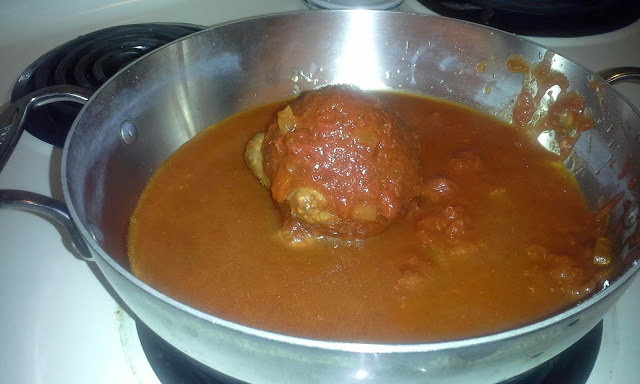 Put your leftover sauce into a pan. It's ok if it's still a little frozen in the middle, I never wait for it to thaw completely! 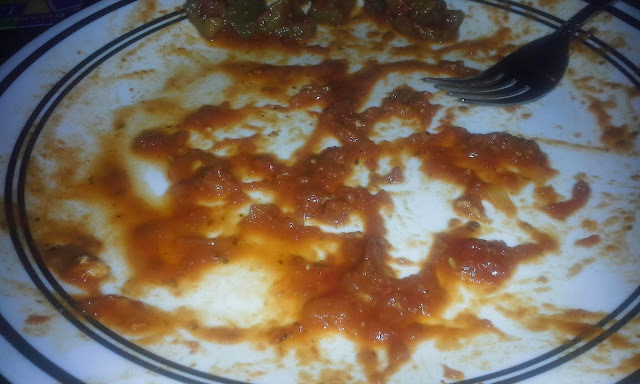 If you look carefully, you can see that there were a couple pieces of sausage in my leftover sauce...surprise! I had no idea they were in there! 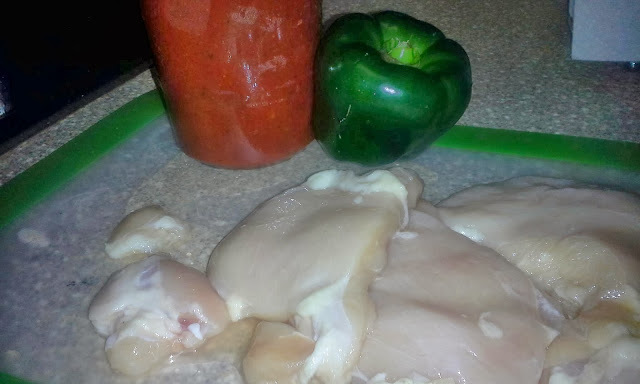 Toss the chicken and peppers into the sauce, give it a stir, and cover. Simmer it on mediumish speed while you cook your pasta. 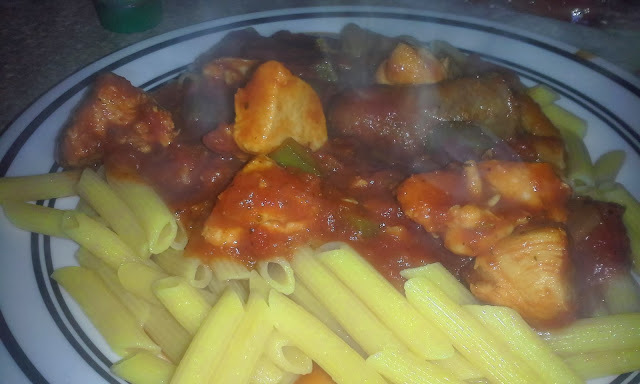 Serve over pasta - our favorite is penne because it really holds the sauce. Just make sure you pick something hearty enough to stand up to the heavy sauce! I know, I haven't posted in ages. But I am now! Woohoo! Last semester ended great, with straight A's again. I loved all of my cooking classes - they were a blast! Classes start up again next week, and I am taking a whopping 18 credits. Lots of cooking! One of the best things to come out of last semester was a newfound love for corned beef, coutesy of my American Regional Cuisine class. I had never tried it before preparing it in class, and it has become a new favorite. 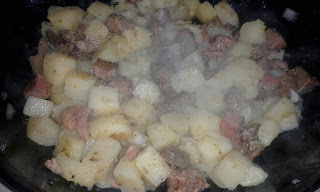 AND it doesn't clash with my total hatred for leftovers...can you say corned beef hash??! Corned beef hash has become my go-to breakfast. I was craving it this morning, but had no corned beef. What's a girl to do??! I came up with a delicious solution...leftover beef tenderloin from Christmas dinner! (No, I didn't have two week old beef sitting in the fridge...I was going to throw it away - it was mostly scraps, and we were going out of town for a week, but I just can't bear to throw food away, so I tossed it in the freezer!) I gave it a quick thaw, tossed it with some pickling spices for a hint of corned beefiness, and I was ready to go! 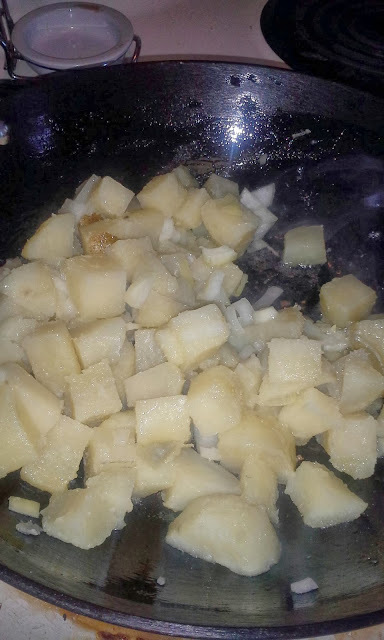 Once your pan is hot 'n ready, toss in the potatoes and onions and give them a stir to get them nice and coated with oil. Make sure you have enough oil to really cover them - you don't want it to stick!! Once your potatoes and onions are all mixed around, toss in the meat and give it a stir. Press down to a nice, even level, then LEAVE IT ALONE! You want it to get nice and crispy on the bottom, so don't stir it around. I usually set the timer then walk away, because I just can't resist the temptation to stir. 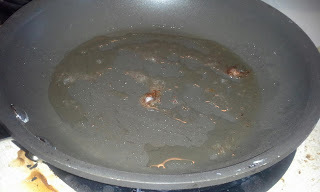 Start with 5 minutes, then stir them around to see how they are - you want them to start to brown and get nice and crispy. 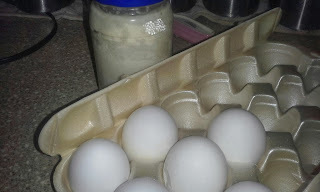 While you are resisting temptation to stir your hash, get your eggs ready to go. 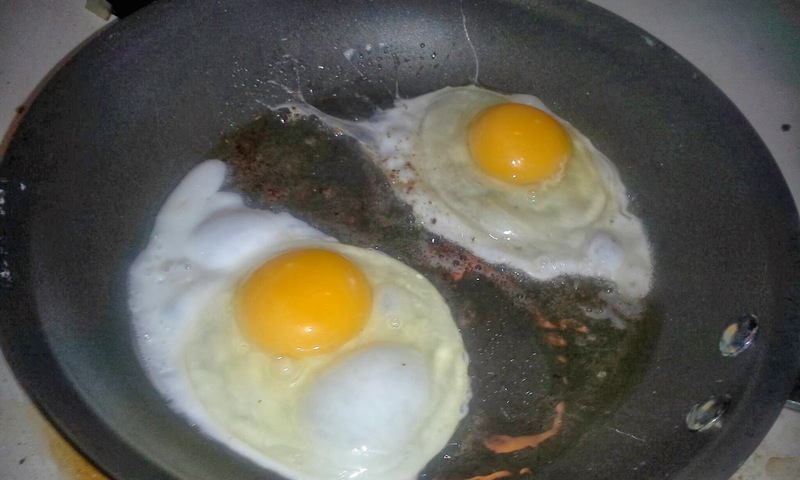 Toss in a couple of eggs (gently, of course) and fry those babies up however you like them. My house goes for over easy or sunny side up, but I won't judge you if you want to cook them another way. 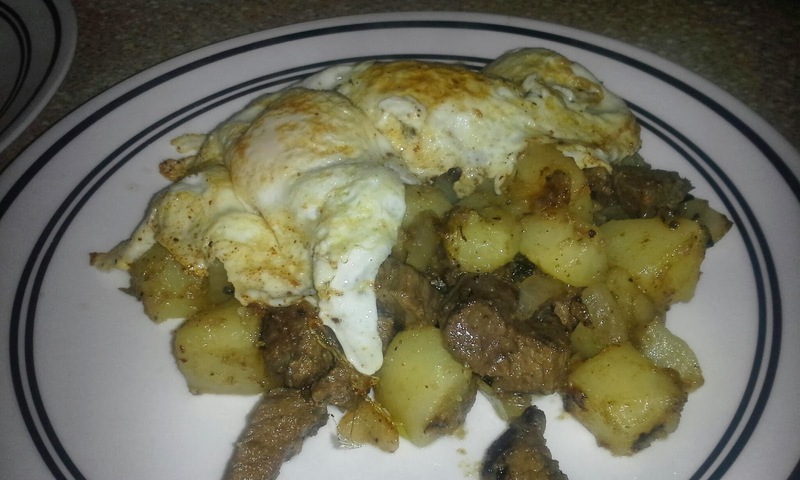 Plate up your beautiful hash and top them with your eggs. A bit of salt and peper, and maybe a little squirt of ketchup (if you're into that kind of thing), and you have pure breakfast perfection!! Go make yourself a big old plate of hash...then enjoy your nap afterwards!! Isn't that what Sunday is for??!! Oh, summer...how I love you. I can't believe you left us so soon. I will miss your sunny goodness. Lounging poolside. Trips to the beach. Soaking up the sun. Delicious summer fruits and vegetables. Is it just me, or did this summer go by FAST? One of my favorite summer treats is fresh, sweet corn on the cob. The last time I went grocery shopping, Walmart had a great sale on corn, so I snatched some up. Then, I put in in the fridge and forgot about it. By the time I got around to making it, the corn had lost some of its summery perfection. Don't get me wrong - it was still beautiful. Just...not quite as beautiful as when I first got it. Some of us get better with age, but unfortunately for this beautiful sweet treat, fresh corn really should be eaten as soon as it's picked. As I was pondering what to do with these less-than-perfect summer gems, it hit me. There isn't a food on the planet that doesn't benefit from a little butter and cream. And corn is no different! Plus, it was SUPER easy to make, and it turned out GREAT!! Use a sharp knife to remove the kernels of corn from the cobs. Then, use the back of the knife (or a spoon) to give the naked cobs a good scrape to get all of the sweet, corny, milky goodness left on the cobs. There is a lot of liquid left in there! 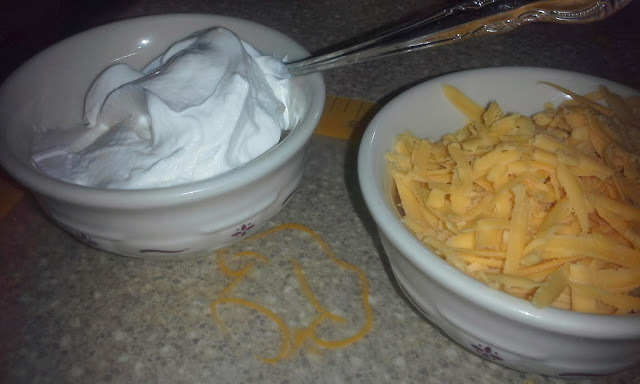 I cut and scraped directly into a saucepan, then added a little bit of butter (about 3 Tbsp) and the cream. If your corn isn't sweet enough, add a touch of sugar, and season with salt and pepper. 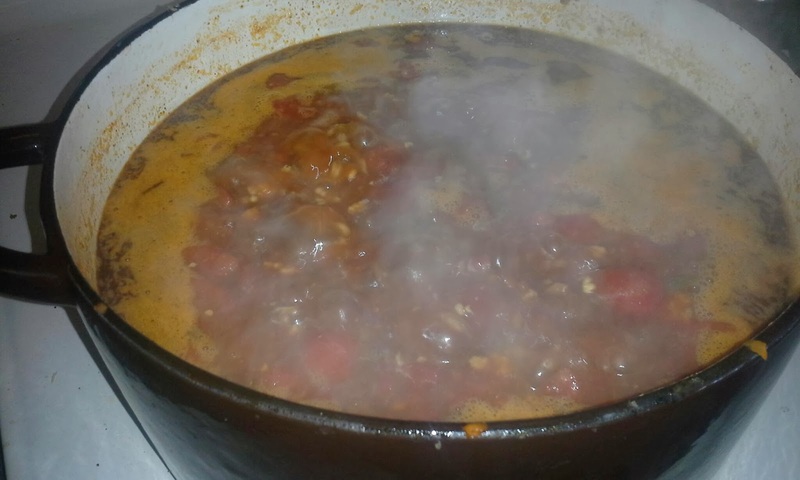 Then, just simmer the corny, creamy mixture until it's nice and tender, about 15 minutes. I let mine to a little too long without watching it, and the cream evaporated too much. 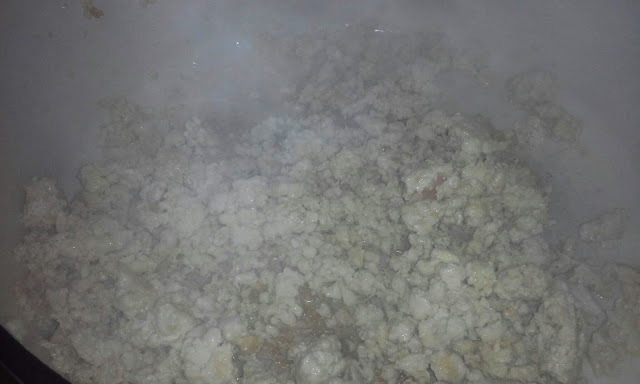 Some of the kernels got a little brown. But that's ok! It was still delicious! Next time, I won't walk away while it's cooking (I have a bad habit of doing that!) and add a little milk if it starts to evaporate too much. The ultimate test is the family - if they don't like something, I'll never make it again. What did they think of my creamed corn?